I used the Dreamweaver LJ846 stencil for these cards. Love ferns and this stencil BIG GRIN. For the first card, I masked off a 1" border all around. Lay my stencil down and applied Distress "Crushed Olive" all over then hit it with a bit of "Forest Moss". Applied the regular white paste which picked up the water based green pigment on the card, so I used that for the card below... Removed the stencil and dried it naturally. Stamped the sentiment on white cardstock using Versafine "Olympian Green" and touching here and there with Black Onyx, then clear embossed. Die cut with Spellbinders "Fancy Tags" die set and sponged with my dirty green sponge. Adhered to card and added the pale green rhinestones. I did that by masking off the center white area leaving a 1 border all around which I sponged with Olive and then lightly with "Frayed Burlap". Stamped my sentiment with the black. Drew in my outline border with the olive marker. Voila, all done. i thought the second card was the fern stencil debossed! Beautiful CAS cards! 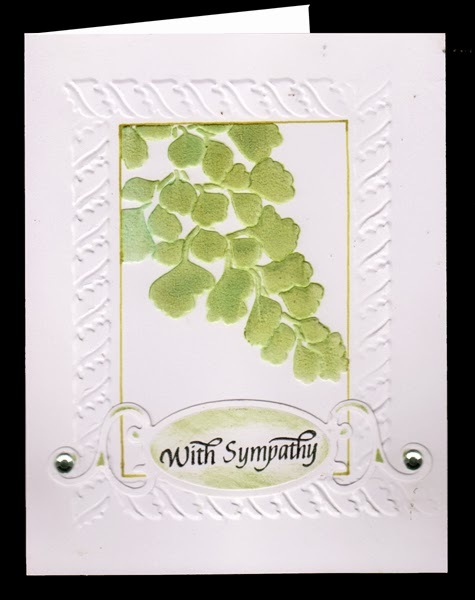 There is something so soothing about ferns, and I love them for sympathy cards. I need some for my stash, too. I always make them at the last minute and then it's so difficult. Both cards are lovely Yogi! 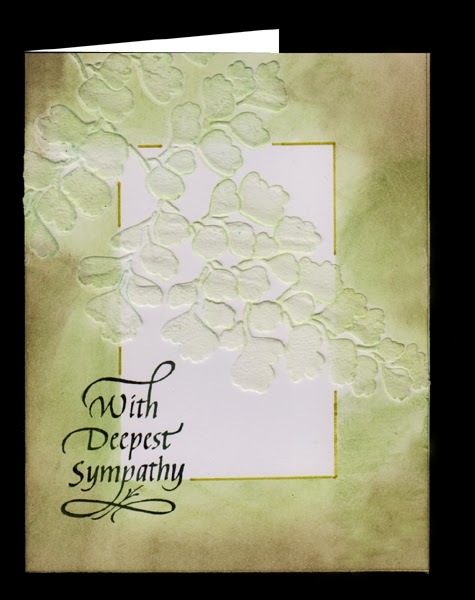 The CAS style is perfect for Sympathy cards. Thanks for joining the Dreamweaver challenge! Stunning cards! You work the stencil and paste perfectly. Thank you for sharing with us at Sweet Stampin' this week. Thank you for joining our Anything Goes at Brown Sugar this week! Good luck! Yogi...this is elegant and simple as well...and TWO of them WOW! Thank you for joining our CAS challenge at Dreamweaver Stencils this month. I love both of these, but especially the second one. At first I thought that you had DEbossed it until I read your process in the post. Just beautiful color and texture! Thanks for linking with the Dreamweaver challenge!